Grubs are destructive pests that live under the surface of your lawn. They feed on the roots, taking away the air, water, and nutrients intended for your grass. In the process they also destroy the roots, resulting in a lawn that is discolored and will eventually die. Unfortunately most grub activity until it is too late. The grubs eventually evolve into Japanese beetles which are very destructive to trees. This grub control application is absolutely vital to the continued health of not only your lawn, but your surrounding trees and bushes. These lawn fertilizer treatments are balanced to ensure maximum “greenness” throughout the season, as well as stop weeds from growing. Every fertilization application includes a granular and liquid product, with the liquid application working hard to decrease weed activity. With our turf fertilization package, we guarantee you will have a stunning lawn all season long! In addition to our fertilization treatments, Green Acres Lawn and Landscaping also offers add-on services of perimeter pest control and mowing. The pest control service will help your lawn remain free of destructive insects, as well as keep your ornamental free of bag worms, Japanese beetles, and other harmful bugs. Turf fertilization is one of the key services we offer at Green Acres Lawn and Landscaping. If you are looking for a way to keep nutrients in the soil so that you have a more vibrant & healthy lawn, please schedule a consultation today, and we will assign a certified technician to come to your home and explain all of your options. Turfs that are not properly fed or are given the wrong kind of fertilization applications will be more susceptible to diseases, insect infestations, a lack of moisture, and a lack of vibrancy. With the help of our turf fertilization program, your lawn will have a richer color that will turn heads and stop traffic! Our standard 6-step fertilization program is designed to give your lawn everything it needs throughout the year, as well as prepare it for each season. The first application occurs in the early spring. 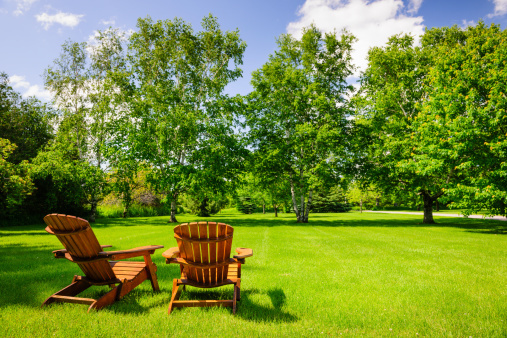 A Green Acres Lawn and Landscaping technician will apply a pre-emergent weed control solution to stop harmful and unsightly weeds from popping up and taking away from the overall beauty of your turf. During this visit your technician will also apply a special fertilization blend that will provide your lawn with everything it needs to kick off the growing season. In mid- or late spring, we will return to apply more weed control to deter the continued growth of broadleaf weeds, which are the most common weeds we deal with in our region. The initial treatment we applied in early spring will still be effective and you will notice that new weeds are not sprouting. Alongside this weed control treatment, we will also apply another round of fertilizer to build on the foundation of solid growth we began in the early spring. During the summer months we will have two applications. The first will help prevent grub infestations. The second summer treatment is a slow release fertilizer that keeps your grass a luxuriously rich color and also will help ward off any symptoms of drought. In the early and late fall we will return to apply more fertilizer. The latter treatment is designed to ensure a quicker green up once spring rolls around again. Call Green Acres Lawn and Landscaping to discuss how our turf fertilizer applications will help you achieve the best lawn on the block!